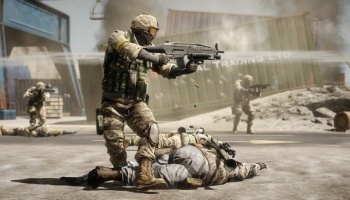 EA DICE's Battlefield: Bad Company 2 has become the fastest-selling game of 2010 in the UK, with server traffic "400% higher" than any other Battlefield title before it. With all the drama and chaos surrounding Modern Warfare developer Infinity Ward last week, you might almost be forgiven for forgetting that another "modern combat" game hit shelves amidst the hubbub - almost. Fortunately for EA DICE, however, it turns out that lots of people didn't forget about Battlefield: Bad Company 2: in fact, quite the opposite. According to GFK Chart-Track, Bad Company 2 "exploded" onto the all-format charts last week in the UK. Outselling the original 2008 Bad Company by 3-to-1, BBC2 topped sales charts for all three platforms on which it was released, with 53% of sales on the Xbox 360, 31% on the PS3 and 16% of its copies sold for the PC. Clearly, you can't just blame the game's popularity on PC fanboys disgruntled about the whole "MewTwo dedicated servers" fiasco. Not only did Bad Company 2 outsell all competition last week, it became the fastest-selling game of 2010 thus far in the UK - no word yet about how it compares in the rest of the world, though. There's a joke in here somewhere about the UK loving BBC, but I'll leave that one to you guys. The game's popularity doesn't seem to be limited to our friends across the pond, though: Demand for the game was so high across the board that all three versions had technological issues created by overloaded servers. According to a post on the Battlefield blog, producer Gordon Van Dyke said that developer DICE was allocating further resources to help lighten the load. All teams are actively engaged in diagnosis and remediation. We are adding additional services to alleviate load. Despite having a major infrastructure in place, the peak traffic this weekend has been huge, 400% higher than any other Battlefield's peak simultaneous users. The teams will continue to monitor the services closely. We sincerely apologize for the inconvenience and will provide further updates on the latest developments as they are relevant. 400% higher than even the bestselling classic Battlefield 1942? That's quite the happy problem to have on your end, DICE. Quite the happy problem indeed.